John McCrae ~ "In Flanders Fields"
I just want to say a huge thank you to all who have served both past and present, I have nothing but respect for you. I agree with owe them a lot. From the earliest wars in our histories to the current ones. Let us NOT forget what they died for. Just want to brag a bit and say my Mom was one of the first Navy "Waves" to enlist when they were finally allowed to during WWII. She is 88 now and her memory is all but gone but the stories she use to tell were very inspiring to say the least. One of my grandfathers used to drive a tank during WWII, I don't recall much of his stories though as he passed away from a sever stroke (had survived two prior) when I was young. This is something I wrote last week for the Kemptville Advance, it'll also be going in the Ottawa South Weekender this week. We should never forget the terrors men and women went through in both World Wars (and countless other wars); nor will we. All four of my grandparents served in WWII; sadly they've all passed on and their stories with them. But I will always remember them and the courage it took to serve in our Armed Forces. When I get some time set aside (maybe at lunch) I will certainly take the time to read it in a way in which it deserves rather than simply being skimmed quickly. I took my 13 year old daughter up to the Harwood Ave. 401 overpass in Ajax this afternoon to pay our respects to the 3 soldiers they brought back this afternoon. It really is an emotional experience. There were hundreds of people on that bridge waving flags at cars going by below. Most of the cars were honking or flashing their lights and the drivers and passangers were waving. Then the Ajax fire department pulled up in three trucks and had the lights on and the firemen got up on one of them and stood along the ladder on top. When the news helicopters were spotted we knew that the motorcade would be coming along shortly. Then you could see a bunch of flashing lights coming up. A bugle player started playing (I think it's called Taps but I could be wrong, it's the sad song they play, not the get up in the morning song). And then the 3 hearses drove under us and people waved flags and then they were gone and then nothing but silence and sniffling noses. I was walking off the bridge with an older lady who had tears in her eyes and she told me she hopes and prays that she never has to go back up on the bridge again. Anyway, I just wanted my daughter to see that even though you see in the news that 3 soldiers got killed on the other side of the world you have to remember that they are 3 human beings with family's and friends. And we always have to remember that we owe a lot to soldiers now and in the past that give us the freedom that we enjoy and allow us to live in the greatest country in the world. I really wish they would bring our troops home because I don't want to have to go up on that bridge again either. It really is an emotional experience. There were hundreds on people on that bridge waving flags at cars going by below. Most of the cars were honking or flashing their lights and the drivers and passangers were waving. Then the Ajax fire department pulled up in three trucks and had the lights on and the firemen got up on one of them and stood along the ladder on top. When the news helicopters were spotted we knew that the motorcade would be coming along shortly. If I lived there I would be out all the time. 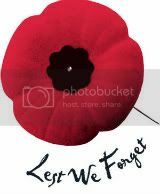 A good percentage of the fallen come from my old base at CFB Petawawa and among those a lot from my old Battalion. So many guys that I knew and trained with have died in Afghanistan and I feel guilty as hell that I got out just before the Afghan mission started (medically but still). Should have said this too but it's people like you FV who do the unselfish things such as this that let the boys and girls overseas and at home know the work they do is appreciated. my hats off to you fv. way to go FV... I live near there and once even got behind the motorcade. Eerie to see cars stopped on the 401 and flags waving every stop. Story in our local paper about one of the last ones says he and his wife discussed the possibility of him not coming back, they were realisitci about the whole thing... unbelievable the dedication and patriotism. My granddad fought in WW1 and my uncle in WW2 (my dad was in the air force too but joined soon before the war ended) both for England ... god bless the soldiers, no firggin way I'd have the guts to do it. unbelievable the dedication and patriotism. You said it! It's a nice gesture but nothing compared to what the troops and their families do for us. My daughter asked me why people go up on those bridges because the soldiers are dead and don't know we were there (she's 13). 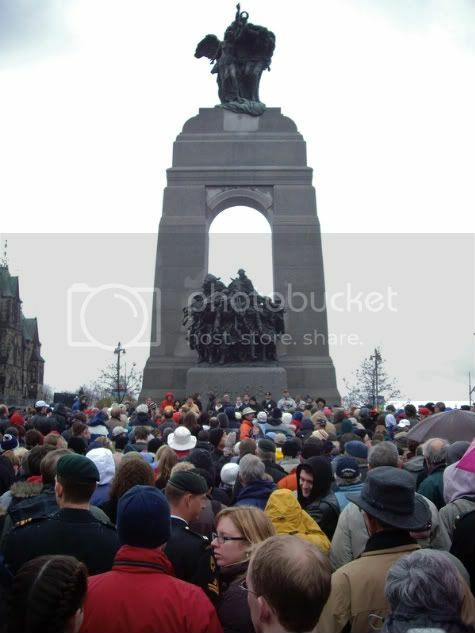 I told her that it shows the soldiers families that they aren't alone in their grief and more importantly shows the troops still fighting that Canadians care about them. btw enjoy the time with your daughter. I went up a nearby crossing bridge with my 13 yr old daughter once and she was totally moved by it. Of course when she got into grade 9 and turned 14 hormones and boys kicked in and I went fromt he smartest peson in the world to the dumbest. I hear it only last 10 years though. Great explanation of the why! Unfortunately, another convoy is going to pass beneath that overpass. Four more soldiers were killed in two seperate roadside blasts today. One of them, Scott Vernelli, was in my unit when I was there. Great guy but we never got along. Doesn't make the sting hurt any less. I hate seeing guys I trained with getting killed in that shithole by cowards who refuse to fight conventionally. I just hope they know that everyone back here, regardless of your stance on war, wishes those guys and girls the best and wants to see them come back unharmed. I heard about this on my way home from work tonight. Sorry to hear you knew him Jason. I agree, it's a shithole and the armpit of the planet. We've lost enough of our kids over there fighting for people that don't even want us there. BRING THEM HOME!!!!!! ENOUGH! 116 Now! Sorry to hear the personal connection. It's almost becoming habit for me to see people standing on the bridges now... sad. Canada's last surviving First World War veteran celebrated his 109th birthday in Washington state on Thursday. John Babcock, who now resides in Spokane, Wash., said he intended to celebrate the occasion in a modest way by having lunch at a favourite restaurant with family and friends. Veterans Affairs Minister Greg Thompson will also attend the luncheon. Babcock was born July 23, 1900, on a farm near Kingston, Ont. At 15, he lied about his age so he could enlist in the army. He arrived in England a few months later with the 146th Battalion of the Canadian Expeditionary Force, but in August 1917, after the truth about his age was discovered, he was sent to the Boys Battalion — a corps of 1,300 young soldiers training until they were 18. The war ended before Babcock was old enough to go to the front lines in France. He moved to the United States in the 1920s and became a U.S. citizen in 1946. At the time, dual citizenship was not allowed, so Babcock had to give up his Canadian ties. He was again granted Canadian citizenship in 2008. God Bless him for sure. FYI - if you have a relative that served in WW1 you might be able to find their info online - I am on ancestry.ca these days and found my grandfather's regimental records... photos of the actual records, it was so cool. He was born in 1899 but as above, lied about his age at 15 to get in. If you are into family history there is tons of neat info available now online. I swear that sometimes I think that half of our fighting Forces in WWI were underaged! Both my grandfathers lied when they signed up about their age! Growing up, I have heard and read that pretty consistently. Brave young lads, they were.